What audio and video formats are available? Depending on the type of recording, GRN may have multiple formats available for download. Audio MP3 standard quality - good quality audio files suitable for general purpose playback - approximately 1MB per minute of playback time. Audio MP3 low quality - more compressed audio files suitable for playback on personal devices eg: mobile phones - approximately 0.3MB per minute of playback time. 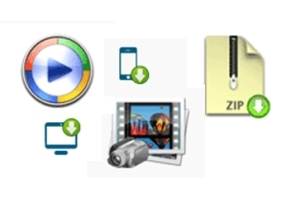 Audio Single ZIP file standard quality - all the standard quality audio files for a single program zipped into one file for downloading convenience - approximately 30MB for a 30 minute program. Audio Single ZIP file low quality - all the more compressed audio files for a single program zipped into one file for downloading convenience - approximately 8MB for a 30 minute program. Video MP4 standard resolution - a single good quality MP4 file that contains pictures accompanying the gospel presentation in 640x480 resolution (2.0 level H.264 compression) - approximately 50MB for a 30 minute program. Video vcd AVI files - a single VCD resolution video file that contains pictures accompanying the gospel presentation in 352x288 resolution (MPEG-4 Video XVID) - approximately 20MB for a 30 minute program. Video 3GP very low resolution - a single poor quality file of pictures and audio suitable for use on old mobile phones and bluetooth transfer in 176x144, 8kHz audio - approximately 5MB for a 30 minute program. Audio M3U playlist - a single small file containing links (not the actual audio files) to the standard quality MP3 files and will create a playlist on your player. You must be online for these items to play. How do I choose which format to download? We recommend that, where possible, you download the good quality high resolution files as these provide the best quality gospel presentations. The low quality MP3 and video files are designed for playback on small portable devices like mobile phones. These files are smaller in size. The decision to download smaller, lower quality options can depend on the following. Bandwidth - if you have a fast connection to the internet, consider downloading the largest file available in your chosen format. Data allowance - if you have a large data allowance, consider downloading the largest file available in your chosen format. Sharing - if you are intending to share this file directly to other devices using bluetooth or other peer to peer connection, consider downloading the smaller files. Also consider sharing video files where available, as these contain multiple gospel messages in the one file and are often easier to share. Storage - if you need to store a large number of recordings, and/or your device does not have alot of storage capacity, consider downloading the smaller files. Usage intentions - consider also whether you are playing back the material on big screens, playing to groups via a sound system, and the quality and capability of your playback device. Why does my audio recording only have 1 or 2 tracks? Audio recordings that contain 1 or 2 tracks may have been optimised for cassette or record use and we do not yet available a multi track version of the recording. The process of making multi track versions of existing recordings is ongoing, and the website will be updated when these are available. For further information on formats, please contact us.